This week’s recipe didn’t start with Bugs Bunny. Yet because of my never-going-to-grow-up Peter Pan brain, or is it brain pan, it definitely ended up there. That makes the Bugs Bunny reference clearer, right? When we were kids, we didn’t go to church, opting instead to stay home and watch cartoons. Fortunately for us, all the good cartoons were on Saturday morning, so we had our Sundays free to worship as we pleased. One result of this is that my grasp of Biblical allusions is dwarfed by my gift for dropping Loony Tunes references. So what happened when Bugs Bunny dropped a Biblical reference in our childish laps? For those of you not literate in the work of Tex Avery and Robert McKimson (Bugs’s creators), let me give you an example. 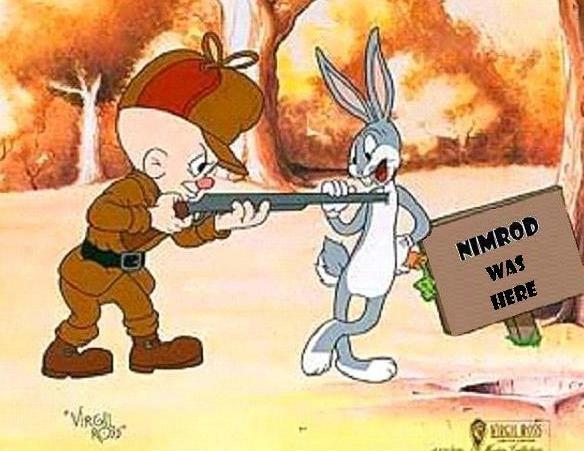 In Elmer Fudd’s perpetual hunt for the rascally rabbit (sic), Bugs occasionally referred to the bald-headed hunter as a Nimrod. To all of you experts in the Good Book, this is a clear and obvious reference to the great-grandson of Noah, a man known for his prowess as a hunter. To those of us not up on such things, this wasn’t an ironic Godly putdown, it was a fabulous new word along the lines of doofus, moron or imbecile (always a welcome addition to a young boy’s vocabulary). In and of itself, this is not a problem, but once you grow up, you’re supposed to know better. Imagine a twenty-something young man having lunch with his parents and some of his father’s PhD engineering and physics colleagues. Somehow the topic of Nimrod comes up. “Who is this Nimrod?” someone asks. Several of these highly educated people describe Nimrod as a great hunter. Others speak of him as a powerful Biblical character associated with the Tower of Babel. The young man meanwhile softly mumbles his own cartoon-based understanding. No one except his mother, who, instantly amplified his comment. Silence. Silence. And more silence. Now I can safely say that the subsequent hush and puzzled looks on the faces of the others caused the young man no physical harm. But even figurative mortification can leave a scar. Will my bringing this moment to light help heal this decades old embarrassment? What it certainly does is tie Hunter-style chicken into my not so deeply troubled past. The soup turned out pretty well too. Since I added a whole cup of sauvignon blanc, the white wine dominated the other flavors, but the cooking process, and the tarragon, turned the taste of the wine into a rich, almost honeyed flavor. Personally, I thought the soup was delicious. It evoked thoughts of the Middle East once more (see my tagine recipe here). Not that I was thinking about the Holy Land. It was more reminiscent of the phyllo dough and honey pastries of the region. Too me it was really interesting. To my wife and kids, I had taken a wrong turn at Albuquerque. Try it with some Middle Eastern grilled meat. Right, well, that’s all folks! Melt the butter in a medium (3 quart) soup pot and sauté the onions and mushrooms until they’re tender (5-7 minutes). Add the stock, chicken, tomatoes, wine, potatoes, herbs and seasonings, bring to a boil, then reduce to a simmer for 30-45 minutes. Serve with a nice grilled piece of meat seasoned with Middle Eastern spices. Image Credit: “I am not a Nimrod, in any sense of the word” a classic Loony Tunes image altered reverently by the author. As I work through the Loony Tunes cast of ingredients, I have yet to use rabbit or duck. Is it because of my fondness for those characters? I have made pork soups (with apologies to Porky Pig) and a lot of chicken based soup (without apology to Foghorn Leghorn). Wherever will I go next? Leave a comment. Please nothing dissspppicable. I’ll be reading and responding.